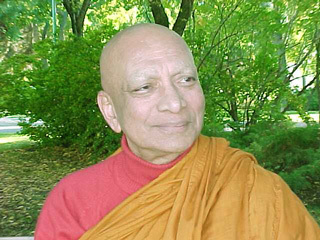 Born Pushpananda Madawela November 26, 1929 in Kuala Lumpur, Malaysia, Ven. Punnaji began meditating when he was five years old. As he grew up in Sri Lanka, he began getting interested in Buddhism while other children were starting school. Academically, he went on to medical school to become a general practicioner, where his name was Dr. Pushpanda Madawela. Ten years later, the doctor changed his name to Ven. Madawela Punnaji and then changed aspirations to become a monk. In 1968, Rev. Madihe Pannaseela at Sri Vajiragnana Dharmaya Ayathanaya, Sri Lanka, ordained the now Ven. Punnaji as a monk. Overall, I do not disagree with the ideas presented here. In other words I do not think they are wrong. What I do think is that they represent a compromise in the manner of presenting the material in a way that is palatable to what Ven Punnaji imagined to be the western mind (and I must say that I do not disagree, even to this day, with his first impression that we were all crazy here and that he had been sent to hell!). To use the term, "anxiety" for example, for "dukkha", while not being incorrect, is not comprehensive enough. This is a word that had great appeal for the upper middle classes during the 1970s. It never reached the intelligent uneducated or the highly sophisticated (the two groups I believe to be most receptive to the ancient teachings): the intelligent uneducated do not admit to anxiety or "fancy" problems (Pain, they admit experiencing, and seeing the world as all "bull-Dukkha" is perfectly acceptable); and the highly sophisticated simply made fun of those who focused so intensely on their own problems such as was the style of the 70s where it seems almost everyone in the middle classes was in therapy. This is an incomplete list compairing some of Ven Punnaji's Pali/English equivalents with those used here on BuddhaDust. It is popularly thought today that Buddhism is a religion containing numerous myths, traditions and mystical practices. If we examine the original Buddhism as taught by Gautama the Buddha, we will discover that it is indeed different from this popular view. In order to clarify this point, let me draw the reader's attention to the distinction between original Buddhism and modern Buddhist practices and belief. It is important not to confuse modern Buddhism as it is practiced in different cultures and societies with what was taught and practiced by Gotama the Buddha and his disciples. What is practiced today in most Buddhist cultures, whether Theravada or Mahayana, are mainly rituals and ceremonies associated with emotionally held traditional dogmas or world-views and objects of veneration. This type of Buddhism is not different from any other religion with different dogmas, rituals and symbols of worship, which serve mankind only in temporarily reducing the anxieties and worries of life, about the here and hereafter. Quite distinct from this modern Buddhism is Original Buddhism which was a practical solution to the basic problem of existence which is the anxiety that underlies all our daily concerns, troubles and tribulations. Without understanding this distinction, it is not possible to examine this psychotherapeutic aspect of Buddhism. Therefore, I wish to emphasize at this point that whenever I use the word "Buddhism", I refer to that original Buddhism and not to any form of modern Buddhism that is practiced by any culture today. In speaking of the psychotherapeutic aspect of Buddhism, I have presented my position too mildly. I would prefer to say that Buddhism is entirely a psychotherapy. My hesitation in doing so, is because it would be too much of a shock to the devout ethnocentric Buddhist. Yet, I would like to remind those familiar with Buddhism that the Buddha says, in the Anguttara Nikaya, that it may be possible for a person to claim to have been free from physical disease even for a hundred years, but it is not possible for a person to claim to have been free from mental disease even for one day, except for an Arahant or a perfected disciple or a Buddha. It is recognized by all Buddhist scholars that the ultimate aim of the Buddha, according to the Pali Nikayas, is to produce Arahants. Arahantship was the culmination of the Original Buddhist Practice. If the Arahant is the only person with perfect mental health, the aim of the Buddha was to produce mentally healthy personalities. This means that Buddhism is a psychotherapy or rather the ultimate psychotherapy. 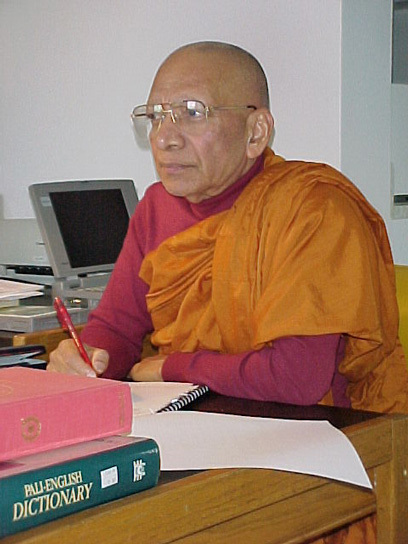 In the Pali Nikayas, the Buddha was called the "Unsurpassable physician and surgeon" (anuttaro bhiSakko sallakatto) and also the "Unsurpassable trainer of persons" (anuttaro purissa dhamma sarati). Expressed in modern language, these terms may be rendered as "the super psychiatrist" and "the super personality trainer". Let us now examine Buddhism in relation to modern psychotherapeutic concepts to find out whether this claim is true. When I examine the history of the evolution of modern psychotherapeutic concepts, I find that all modern theories and practices are centred around one important problem which is understandable in terms of the structural hypothesis presented by Sigmund Freud (in 1923). Almost all modern therapeutic systems could be described in terms of this structural hypothesis. These different systems could be broadly classified into two groups, that is, (a) those therapies that are mainly concerned with the Id and its expressions and (b) those that are mainly concerned with the Ego and its functions. The Id psychologies can also be seen as affective therapies and Ego psychologies as cognitive therapies. It is not possible to discuss in detail these different therapies within the limits of this presentation. However, I wish to draw your attention to this all important psychological problem revealed through the structural hypothesis of Freud. The reason for my drawing your attention to these important assumptions of modern psychotherapeutic thinking is to facilitate the introduction of the Buddhist concepts that underlie the Buddhist therapeutic technique. I would not be able to do justice to this subject within the brevity of this presentation. Though there are many aspects of the therapeutic technique of the Buddha, I can summarize the teachings of the Buddha to make you aware of the basic principles on which this Buddhist psychotherapy stands. I see no better way to introduce these basic principles than to discuss the contents of the first sermon of the Buddha called the Dhammacakkapavattana Sutta, appearing in the Samyutta Nikaya, and translated by me as "The Revolution of the Wheel of Experience". The first point elaborated in the Sutta is that there are two extreme modes of living to be avoided. One is the pursuit of sensual pleasure which is bi-polarized as seeking sensual pleasure and avoiding sensual pain (Kamsukallikanuyoga). The other extreme is self exhaustion through self-denial and asceticism (Attakilamatanuyoga). Avoiding these two extremes, the Buddha teaches a third intermediate mode of living (Majjima Patipada) called the Sublime Eight-fold Way (Ariya Attangita Magga). This third intermediate way consists of an awareness of reality and is accompanied by thinking, speaking, acting and living in harmony with it. This teaching of the Buddha could easily be understood in terms of the structural hypothesis of Freud. The pursuit of sensual pleasure is nothing but the activity of the Id. The special emphasis of Buddhism is on the fact that gratification of the Id, through seeking sensual pleasures does not lead either to mental health or happiness. This concept is not entirely in conflict with Freudian thinking because Freud recognized that emotional maturity is gained through the overcoming of the pleasure principle by the reality principle. Some modem psychologists still believe that gratification of the Id in some way is necessary for mental health. This of course is not entirely denied in Buddhism, as we shall subsequently see. Self exhaustion through self denial is again, obviously, the activity of the Super Ego. According to Buddhism, being guided entirely by the Super Ego is not conducive to mental health. This too is acceptable to psychoanalytic thinking as according to Freud, a complete repression of the Id in this way leads to the utilization of the full psychic energy available to the ego in this task of repression and therefore leaves the Ego ineffectual for dealing with external reality. The healthy intermediate mold of living recommended by the Buddha, which is to align one's thinking and living in harmony with reality, is undoubtedly the activity of the Ego, from a Freudian standpoint. Since, according to Freud, maturity consists in being dominated by the reality principle, this intermediate way of the Buddha falls in line with the Freudian concept of mental health, which is also the generally accepted view of all modern psychotherapists. It is also recognized generally in modern psychotherapy that an adequate sense of reality or the ability to distinguish between the outer world and the inner world of wishes and impulses is an important indication of mental health. In severe mental illness, this ability is considered impaired or totally lost. This sense of reality is present to a greater degree in the neurotic and in the psychotic. However, modern psychologists admit that even the normal person is not perfect in this ability to distinguish reality, thus agreeing with the Buddhist position. An important aspect of the development of the sense of reality, is the ability to distinguish between 'self' and 'not self', or what is under one's control and what is not under one's control. Freud recognized [in 1911] that frustration of the Id due to the impermanence of external objects is the most significant factor in the development of the concept of self in the infant and the demarcation of the ego boundaries or the line that separates the 'self' from the 'not self'. The Buddhist psychotherapist, it must be pointed out, does not play the role of a doctor in his therapeutic practice. His role is that of the teacher. His technique of therapy is a process of education. We might even go so far as to say that Buddhism is a form of Ego therapy or cognitive therapy. The first thing that the student learns is that goodness and happiness are not opposed to each other, for goodness is happiness. To put in Freudian terms, the pleasure seeking of the Id is not wrong or evil but true pleasure is not the pleasant sensation but inner happiness. This inner happiness is achieved through relaxation and calm rather than through stimulation of the senses, excitement, tension and release of tension. Happiness is gained through the relaxation response. In other words, the student is enlightened about the need to pursue the goal of calm in order to satisfy all three parts of the personality, namely the Id, the Super Ego and Ego. The Id is satisfied because calmness is the way to happiness. The Super Ego, which seeks to do what is good and right, is satisfied because calmness is the way to be good. The Ego is satisfied because calmness is the realistic way to be happy and good and therefore calmness is realistic. Calmness also helps the student to get in touch with reality without interference from the wishes and impulses. This way the Ego, which seeks to be realistic, is satisfied. The pursuit of this harmonizing goal of calmness which resolves the conflict within and without is called the Sublime Pursuit (Ariya Pariyesana) and this way of life is called the Sublime Way (Ariya Magga) or the Harmonious Way (Samma Magga). It is also the way of mental health (Arogya). This explanation of the Buddha's teaching in terms of modern psychological concepts is not done with a view to obtain support for the Buddhist position from modern psychology but to make the Buddhist position intelligible to the modern mind acquainted with modern psychological concepts, and to show that the Buddhist psychotherapeutic is not only relevant in the modern world but also a constructive contribution to modern psychotherapeutic thought. The first sermon of the Buddha, which we are in the process of discussing, introduces the subject in the foregoing way, and proceeds further to discuss the basic problem of anxiety, called Dukkha. This anxiety, according to the Buddha, is experienced in relation to seven basic situations: 1) birth, 2) old age, 3) disease, 4) death, 5) meeting unpleasant people and circumstances, 6) parting from pleasant people and circumstances, 7) frustration of desire. The totality of anxiety is also presented as an aggregate (khanda) or body (kaya). It is the sum total of all experienced phenomena analyzed into five aggregates which are personalized, to form the experience of "self-in-the-world". This five-fold totality of personalized phenomena is called Pancupadanakkhanda. It is also called Sakkhaya, which means "personalized body". This may be compared to the concept of "self image" or "self concept" that is found in modern psychology. This "self-image" which is the result of the personalization of phenomena is seen as a bundle of anxiety by the Buddha and this anxiety is bundled up through the process of personalization which results in the concept of "being self" [bhava]. All worries, anxieties, fears and feelings of insecurity, which are basic to life, are the result of this process of personalization (Upadana) and being a self (bhava). This process of personalization is associated with the feeling of power over what is personalized. Therefore, personalization is also seen as the wielding of power (vasavatti) . From this standpoint, in order to remove the basic anxiety that underlies human existence, it is necessary to depersonalize (upadana nirodha) the five-fold totality phenomena and remove the "self concept". Therefore the ultimate purpose of Buddhism is to produce an individual who is free from the emotional experience of "self" within. This is the one who is perfect in mental health and who is called Arahant, the worthy one. Though this ultimate state is rarely reached, the mental health of an individual is measured according to the degree to which the individual has lost his experience of self. The question seems to be a matter of self-boundary or ego boundary from a Freudian standpoint. This is the extent to which a person identifies the things in the world as belonging to himself or as a part of himself. The abnormal person's self-boundary is greater in circumference than that of the normal one. The normal person's self-boundary is greater in circumference than that of the supernormal one. The supernormal person's self-boundary is greater in circumference than that of the sublime one. Buddha therefore recognizes two levels of being above the normal level, the supernormal (uttari manussa) and the sublime (ariya). The personalization process is dependent on what is called tanha, which in literal translation is thirst, which is similar to the Freudian urge. This thirst, or tanha, is three-fold: the thirst for pleasure, the thirst for existence and the thirst for non-existence. It is interesting to note that the Freudian concept of drives which included the sexual and the self-preservative drives at first, and later proposed as the life and death drives, seems to coincide with the Buddhist concept of tanha. It seems that psychologists are rediscovering what the Buddha discovered 2500 years ago. Yet the aim of Buddhism goes beyond the aim of modern psychology in that a complete disappearance of tanha is aimed at. According to Buddhism, perfect mental health is not achieved until this thirst has been completely rooted out. Although modern psychology seems to rest satisfied by making an abnormal person normal, Buddhism aims at removing even normal mental discomfort and unhappiness by bringing about perfection of health. It is interesting to note that the Buddha recognizes nine levels of mental health above the normal stage. This is discussed in detail in a sutta in the Anguttara Nikaya (A IV 44). Of the nine supernormal (uttari manussa) levels of mental health, the ninth one which is called the sublime level (ariya bhumi) is further analyzed into four levels of personality: 1) that Stream entrant (sotapanna); 2) the Once returner (sakadagami); 3) the Non-returner (anagami); and 4) the Worthy One (arahant). Modern psychology, of course, does not seem to think that it is possible to remove this thirst or urge altogether. Yet Eric Fromm points out that Freud's ultimate aim was to remove the Id entirely and he quotes Freud as saying, "in place of the Id there shall be the Ego." This seems to support the Buddhist position. The first sermon of the Buddha that we are discussing goes on to explain further the technique by which this thirst is removed. This technique is called the Sublime Eight-Fold Way which we discussed earlier as the medial mode of living that avoids the two extremes: the pursuit of sensual pleasures, and self exhaustion through "self denial". This Eight-Fold Way begins with what is called samma ditti, which is awareness of reality by understanding three important facts of life: 1) instability (anicca), 2) discomfort or anxiety (dukkha) and 3) impersonality (anatta). Anicca, or instability, is the transitory nature of all experienced phenomena to which we become attached and which we personalize, thinking "this is mine", "this is me or myself". Dukkha or anxiety is what is experienced due to the experiencing of what has been personalized. This anxiety is the result of a clash between the wish for permanence and the reality of instability. Here we begin to distinguish between the wish for permanence and the fact that we do not wield any power over anything because we cannot make permanent what is impermanent. It is the recognition of the fact that we do not have power not only over external objects but also over what is within the body which is identified as self. In other words, if ownership is seen as lordship or wielding of power over what is owned, we own nothing in the world, not even what we call ourselves. Therefore, there is no basis for the concept "mine" or "myself". In other words, the "self concept" is also seen as made up of our wishes or impulses. This is, in Freudian terms, reality testing or distinguishing between reality and a wish. This way we acquire the healthy sense of reality which removes all anxiety. This understanding results in an emotional state of calmness, happiness and kindness. Such an emotional state leads to good external behavior, verbal and physical, which is regarded as good socially. A life based on this perspective and this emotional state and behavior is a harmonious life. And this harmonious life has to be maintained and perfected by means of the harmonious practice. In discussing the harmonious practice we come to another aspect of Buddhist therapy which is in line with a different kind of psychological technique from what we have just discussed. The modern psychological technique that falls in line with this practice comes under what is called the Behaviour Therapies. This practice could be described by using terms like desensitization, operant conditioning, and also the learning theory. Buddha regards even mental processes as habits of thought which have been learned and which could be unlearned by consciously stopping their repetition, and constantly practicing wholesome thoughts. What are regarded as wholesome thoughts are those thoughts that are calming. Those that excite the mind and produce tension are regarded as unwholesome. Buddhism also recognizes that affective mental processes or emotional excitements are rooted in cognitive mental processes, such as the formation of concepts or interpretation of experiences. According to how you interpret the situation, you become emotionally excited or become calm and relaxed. These interpretations that produce excitement are always associated with a "self-concept" or "self-image". If we carry bad self-images habitually, we become habitually unhappy individuals. By practicing good thoughts we begin to eliminate these bad self-images and cultivate images of calm. The calm mind is able to observe the subjective experience objectively and this brings us to the next step which is the harmonious awareness. In the harmonious awareness, one becomes aware of the subjective experience objectively and by the constant practice of this awareness, one begins to depersonalize the subjective experience. This way the personality perspective (sakkaya ditti) is gradually removed followed by further gradual removal of all thoughts of "I" and "mine". This gradual depersonalizing process calms the mind further and leads to the experiencing of progressively deeper levels of tranquillity and happiness, leading to the perfection of mental health with the complete eradication of the experience of self within and the rooting out of thirst, and the disappearance of all anxiety for good. This ultimate state of mental health is rarely attained in modern Buddhist practice, but this is the final goal of the Buddhist as taught 2500 years ago. These principles of Buddhist psychology could be used in the modern world and could be constructively used by modern psychotherapists. Space limitation does not allow me to discuss in detail, in the present essay, the various cases where the Buddha has used these principles in his time. For the same reason, I am unable to discuss here some of the cases in my own experience where I have used these principles. The most important of all is the use of these principles on oneself. I would like to state, in passing, that I have tested in my own experience the validity of these principles. In discussing the First Sermon of the Buddha called the Revolution of the Wheel of Experience in this way, as the process of transformation of an individual's personality from an unhealthy one to one of health, I might appear to have strayed away from the Orthodox Theravada, Mahayana or any other Buddhist tradition. But as I pointed out earlier, I am not discussing any form of modern Buddhist standpoint or practice. I am discussing the Original Teaching and Practice of the Buddha as found in the earliest sources recognized by all scholars which do not belong to any modern school of thought. I hope this effort will kindle your interest in exploring further the early teachings of the Buddha. I believe that if modern psychologists make a serious study of these early teachings of the Buddha, it would become a significant turning point and breakthrough in modern psychotherapeutic thought and practice. This concludes the essay "Buddhism as Psychotherapy"
Buddhist meditation, as we teach it, is not a mystical practice; we are not teaching people to become mystics. This technique of meditation is for people who are living a secular life as householders, doing jobs, having responsibilities, and involved in various relationships. What such people need is freedom from stress, peace of mind, healthy relationships, self-confidence, success in life, and efficiency at work. This means, learning to gain control over the emotions that prevent one from thinking rationally or acting intelligently. These problematic emotional excitements come in the form of anger, lust, worries, fears, and anxieties. The form of Buddhist meditation we teach helps one free the mind of emotional disturbances and help one to think clearly and act rationally. This technique of meditation does not involve chanting mantras, exercises in concentration, or entering trance states. It involves efforts to consciously purify and tranquilize the mind. When the mind is purified, one experiences an inner happiness, a physical comfort, a kindness and compassion, that one has never experienced before. The happiness that we refer to is not a state of emotional excitement. Nor is the kindness and compassion we teach based on an attachment. The happiness we speak of is a tranquil state of the mind, and the kindness is a state of selflessness. As we understand, emotional excitement is not true happiness, and attachment is not true love. Happiness and kindness are attributes of the tranquil mind. Therefore this method of meditation is aimed at cultivating a relaxed body, and a calm mind, resulting in the experience of happiness and kindness of heart. You may have heard of the two terms - samatha and vipassana. Samatha is the cultivation of tranquillity, and vipassana is what is normally translated as insight. Most people when they speak of samatha meditation, they think it is practicing concentration, but true samatha is not concentration. Concentration only leads to the hypnotic state. Samatha is not the practice self-hypnosis. Properly understood, samatha is purifying and calming the mind. The term vipassana is also commonly misunderstood because it is usually translated as insight. The term vipassana is commonly confused with the psychological meaning of the term insight. In psychology, insight is understood as a sudden understanding of the solution to a problem. In psychotherapy it is understood as bringing to consciousness the unconscious motive of a conscious action. Vipassana, on the other hand means, the direct analytical awareness of the totality of experience at a given moment. Experience is the subjective aspect of the reaction of an organism to environmental stimulation. This reaction can be broadly analyzed into the parts: sensory perception, thinking, feeling, and acting. Vipassana, therefore, is to see this experience in its parts, as an impersonal process of activity. There is also a philosophical meaning of the term vipassana. Experience is normally seen as the interaction between a subject and an object. The Buddha taught that the existence of a subject and an object is only an experience. Therefore experience precedes existence. Experience is the basis of existence. Experience is the ground on which existence lies. Normally, we not only experience existence but we are also involved in it. We get involved by forming relationships between the subjects and the objects experienced. This involvement is a suffering. The way to end this suffering is to stop the involvement by stopping the relationships and focusing attention on the experience. This is NIRVANA the sumum bonum of Buddhism. Vipassana therefore is the cultivation of the awareness of experience instead of the awareness of existence. This definition of vipassana might be confusing at the beginning, but it will become clearer as one progress in meditation. The first step in meditation is to learn to purify the mind. Very often people refer to meditation as sitting. It needs to be emphasized here that as we see it, meditation is not sitting. Meditation is a mental process, not a physical one. Of course when you see a statue of the Buddha you often see the statue in a sitting position, but that doesn't mean that you have to become like a statue. That is not the aim of Buddhism. We are not trying to become like statues. Meditation has to be seen in a different way. Meditation is a way of living. The main thing in Buddhist meditation is to practice what is called the Super-normal Eight-fold Way. You may have read about it in books as the Noble Eight-fold Path. We find the former translation more meaningful. It is the term "ayria" which is usually translated as "noble." The Buddha used the term "ariya" to refer to a higher level of consciousness which could be developed through a proper practice. It is a level beyond the normal. It is more meaningful to translate it as "supernormal," rather than "noble." The aim of Buddhist meditation is to raise the human consciousness to a higher level of experience, beyond the normal. Just as the aim of modern psychotherapy is to raise an abnormal person to a normal level of living, the aim of the Buddha was to bring the normal person to a super normal level. It is very important to understand this distinction between "noble" and "supernormal." This is why we like to call Buddhist meditation a growth technique, rather than the practice of rules of conduct or the rituals of sitting or walking meditation. Therefore, the purpose of the practice of Buddhist meditation is to grow to a higher level of emotional maturity, beyond the normal, and to experience a degree of happiness and kindness beyond the normal. Buddhist meditation is a method of gaining emotional maturity through purification of the mind. This process is of growth takes place according to natural law and following a human technique. It doesn't happen automatically or through supernatural power. We are not depending on any external aid, not even a teacher or guru. This practice is based on self-reliance. We must to do it by ourselves. This is a do it yourself technique. In a sense, it is the development of will power, to control one's irrational emotions. Will power is not a special kind of mysterious power. It is a natural human potentiality we are born with, but one that has to be developed. Biologically speaking, the human being is a higher animal who has a more evolved brain, specially the fore brain called the cerebrum. The difference between the human being and all the other animals is that all other animals are passively reacting to their environment. The human being has the capacity to delay the reaction to get sufficient time to think and decide which response to make in a given situation and respond rationally instead of emotionally. It is this power to choose the response that is called will power. If we look upon ourselves as organisms born with senses: the eyes, the ears, nose, tongue, and the body. These senses, when stimulated, a reaction occurs in the organism as a whole. For example, when light falls on the eye, seeing occurs. It is not only seeing, but once an object is seen, it is interpreted. This interpretation is followed by an emotional reaction to what is seen, in the form of a desire, hatred, or fear. This emotional reaction is but an emotional excitement accompanied by tension in the body. This tension is experienced as discomfort and it seeks release in action. The action is to obtain what is desired, to get rid of what is hated, or to run away from what is feared. That is the completion of the reaction, which has three stages: the cognitive, affective and active. The cognitive is just the seeing and the thinking part. The affective is the emotional excitement, or the feeling part. The release of tension in action is the active or behavioral part. Normally, all animals below the human level are passively reacting to their environment in this way, where as the human being has the capacity to delay this reaction and decide which response to make in a given situation, by thinking rationally, and the human being is able to make this response by acting rationally. This ability to decide the response and act rationally is what is called "will power." The freedom to choose our actions rationally, and to behave as we want is what is called "free will." Do we really have this ability to make a choice and to act rationally? Unfortunately, this ability to choose and act rationally is not a capacity that is fully developed in the normal human being. This is why we do so many stupid things for which we repent later. Often we want to do something in the right way, but we find ourselves doing just the opposite. That is because this capacity has not been fully developed. Buddhist meditation, when properly done, is the way to develop this capacity. That is what you will be learning to do during our retreats. It is learning how to act rationally instead of impulsively. You will be provided with the tools to work on yourself. Working on your self is your job, not mine. My job is just to give you the tools. I hope you will be able to work on yourself to grow, evolve and transform. The degree of transformation and quality of life experience is the sign of progress. What we hope for is growth and transformation not mere insight. That is why I do not like to call this method of meditation insight meditation. We also do not expect visions or hallucinations of any kind. If you only find that you have more will power after you have gone through a retreat, then you have achieved something. The first step is to acquire the harmonious perspective. The harmonious perspective is the perspective that brings about harmony internally and externally. This a perspective, not mere a right view or right understanding. This is a different way of looking at life, yourself, the world, and your relationship to the world. It is seeing things in a different way, which does not create conflict internally or externally. First is to understand that our emotions come in conflict with the reality of instability, pain, and impersonality. Our emotions seek pleasure and avoid pain. This means, they are seeking permanent pleasure. This is not possible because pleasure is impermanent and pain cannot be avoided altogether. Emotions are also possessive and self-centered. We do not really possess anything in the world because all relationships are impermanent. Our self-centeredness is futile because we can never really preserve a permanent identity or self, because we change constantly, both physically and mentally and we cannot avoid death. This pursuit of eternal pleasure and self preservation is maintained through blind emotions and not through clear reason. Therefore it is important to understand that emotions are coming in conflict with reality, and therefore we should not to be carried away by emotions but by reason. It is also importet that [...?...]. That is, because he thinks that social position is greater than wealth. Another person might think no, popularity is better than riches or even social position so that person might sacrifice wealth, sacrifice high social position to get to become popular to get a good name. Another person might think what is the use of popularity, what is the use of social recognition, what is the use of wealth; what I need is sensual pleasure and keep on enjoying sensual pleasure, that is the greatest thing. So different people have different ideas of what is good or great or superior. And according to each person's feeling of superiority each person will feel inferior. If a person thinks that wealth is the superior thing the moment that he or she meets a wealthy person and in comparison you don't have that much you begin to feel inferior. Or if a person thinks that high social position is superior that person will feel inferior in the presence of any person who is superior in social position. Or if a person thinks that popularity is the greatest thing; that person begins to feel inferior when that person meets a person who is very popular, more popular than himself or herself. Or if a person thinks that enjoying sensual pleasure is the greatest thing again; that person will feel inferior in the presence of some one that is enjoying more sensual pleasures. So this is how people feel inferior or superior. Now this sense of values was shown by the Buddha as something that only brings unhappiness, disappointment. frustration, sorrow, pain, anxieties, worries . . . other than that it is not bad . . . . So the Buddha pointed out that happiness is to be sought not outside in these things wealth, status, popularity or sensual pleasures but it has to be inside, within, and that is simply tranquility of mind, inner peace, calm. If you can see that inner calm is the greatest thing in the world then we will be feeling inferior only when we meet a calm person. And if we are really convinced that calmness is the greatest thing, we don't need tranquilizers because tranquilizers are needed only when you are not convinced that calmness is the greatest thing. You think maybe becoming rich is greater but still I need calm in order to reach that so I will take a tranquilizer. So it is our sense of values that makes us calm or not calm. You have heard this word Nirvana or Nibbana which is regarded as the greatest good of the Buddhist. Some think that Nirvana is some kind of heaven but that is not what Nirvana is. Nirvana simply means calmess, tranquility. Vana means shaking; nir is the negative prefix like non so nirvana is something like non-shaking which means the mind that is unshaken. The tranquility of mind which can never be disturbed. That is what Nirvana is. So if we think that Nirvana is the greatest thing in the world then we become Buddhist as a result. But we don't think that Nirvana is the greatest thing and that calmness is not the greatest thing in the world then we will not be trying to achieve that. So our goal in life changes when our perspective changes. When our perspective changes our sense of values change and when our sense of values change our goal in life changes. When our goal in life changes our thoughts, speech, actions will fall in line with this goal. You don't have to push yourself to meditate. Meditation will automatically happen to you because that is where you are trying to go. Your life is going in that direction see you don't have to make any effort you don't have to make any resolution you don't need to have will power to meditate. You don't have to force yourself to meditate. You don't have to say, I don't have any time; I have to make time. You don't have to say any of those. You will automatically have time because that is what you want to do. If you really want to do something you will have time. You don't have time only when you are not really interested in doing it. "Buddhist meditation, as the Buddha taught it, is a psychological technique of transcending human weaknesses and human suffering through the evolution of the human consciousness. This evolution of consciousness is a process of growth and expansion of awareness consciously achieved through a systematic psychological technique. When this gradual evolutionary growth, expansion, and unfolding of the human consciousness has reached the ultimate point of maturity, this attainment is called the "Harmonious Full Awakening" (Samma Sam Bodhi). The one who awakens in this way is called the "Harmoniously Awakened One" (Samma Sam Buddha). The use of the term "awakening" is to indicate that this expansion of consciousness is an awakening to reality, which means, the normal human being is not fully awakened to reality. That is, the normal human consciousness is not conscious of reality. In fact, according to the Buddha, it is in conflict with reality. This is why the human being is said to be normally suffering, and the aim of Buddhism is to bring this normal suffering to an end. The term "harmonious", means freedom from conflict with reality. It is being in harmony with reality. This also implies that this kind of awakening is not a normal experience. It is a supernormal experience. It is an awakening to a super normal reality, which is quite different from the reality that normal people experience. This supernormal awakening is therefore quite different from the normal awakening from normal sleep. The normal awakened state is, according to the Buddha, a sleep or dream or fantasy. The aim of Buddhist meditation therefore is to awaken from this dream full of suffering, into a supernormal reality, where there is a supernormal level of mental health, goodness, happiness, and truth. Buddhism avoids the common theistic and mystical interpretation of the religious experience as "the union of the soul with God." Instead, it takes a psychological standpoint. Buddhism, being a humanistic religion, is not built around the concept of the Creator God, but is centered on human interests and speaks about human potentials. Buddhists believe that the human consciousness can evolve to a level of divine perfection. A human being who transcends the ordinary human limitations in knowledge, power and goodness, and attains to this state of perfection is called, "God become" (brahma bhuto). This state of perfection is identical with that of the "Harmoniously Awake One", the BUDDHA. From this Buddhist point of view, "God" is seen as the ideal of human perfection that the human being conceives, and struggles to realize through the practice of religion. When the human being does realize this ideal of perfection, he "becomes God". This "God" of the Buddhist may be seen as an anthropomorphic God, though He is not seen as the Creator of the world, or His son or messenger. This "God", from a Buddhist point of view, is seen rather as the destroyer of the world. This is because the world, as the Buddha sees it, is an illusion (maya) created by the human consciousness. It is from this illusory dream that one has to awaken, in order to be free of human suffering. Because the Buddha frees people from this illusion, he can be called the destroyer of the world. This Buddha who is not the Creator of the world, or His son, or even His messenger, but the destroyer of the world can be misunderstood to be a Devil. But the fact that he is on the side of goodness and not on the side of evil supports the fact that he cannot be called a Devil. Buddhists honor and worship the Buddha, because Buddhists believe that He, in the human body, reached the "Supreme State of Perfection" that all religions worship, what ever be the form in which they conceive it. The Buddha is traditionally, described by Buddhists as "the God of gods" (devatideva) and as "God by purity of mind" (visuddhi deva). This is not a deification of a human being but the description of the evolution of the human being. It is also the redefinition of the term "God", and the redefinition of the term "religion" from a humanistic standpoint. From this humanistic standpoint, God does not create the human being, but the human being creates God in his own image. Religion, defined from the Buddhist standpoint, is the struggle of the human being to solve the problem of human existence. This problem is the problem of evil, unhappiness, and death. The solution is sought through the pursuit of goodness, eternal happiness, and eternal life. This pursuit ultimately takes the form of the pursuit of the ideal of human perfection. This ideal of human perfection is seen as the perfection in goodness, happiness, and wisdom. Religion, from the theistic standpoint, has come down to earth from heaven, to solve the problem of a Creator. But from the humanistic point of view, religion has grown up on earth, to solve a human problem, through the perfection of human nature. Buddhists do not therefore speak of a "God become man", but of a "man become God". This "God" of the Buddhist therefore is a "theopsychic man" rather than an "anthropomorphic God". The Buddhist meditation is not a mystical practice. Our aim is not to become mystics. This technique of meditation is for people living a secular life, as householders, doing jobs, having family responsibilities, and involved in various relationships. What such people need is freedom from stress, peace of mind, healthy relationships, self-confidence, success in life, and efficiency at work. This means, learning to gain control over the emotions that prevent them from performing their duties effectively. These problematic emotional excitements can come in the form of lust, hate, fear, worry, or anxiety. Buddhist meditation, practiced in the right way, can help one be free of emotional disturbances, so that one is free to think clearly and act rationally. This Buddhist technique of meditation does not involve chanting mantras, exercises in concentration, or entering trance states. It involves efforts to consciously purify the mind. When the mind is purified one experiences an inner exhilaration. This exhilaration can mature into rapture. When the body relaxes, one feels comfortable. When the body is comfortable, the mind enters a state of equilibrium. When the mind is in equilibrium, kindness and compassion is experienced. Such a tranquil mind can also think clearly, resulting in intelligent behaviour. The rapture that we refer to is not a state of emotional excitement. And the kindness or compassion that we speak of is not based on an attachment. This rapture is a state of happiness based on mental tranquility, and the kindness is a state of selflessness. According to the Buddha, emotional excitement is not true happiness, and attachment is not true love. Therefore our method of meditation is aimed at cultivating a tranquil mind and a relaxed body, resulting in the experience of happiness, comfort and kindness, accompanied by intelligent thought and action. One often hears today of the two terms - Samatha and Vipassana. Samatha is the cultivation of tranquillity, and Vipassana, commonly translated as insight, is the cultivation of the objective awareness of the subjective mental process. Most writers, when they describe samatha bhavana, think of it as practicing concentration, but true meaning of samatha is not concentration. Concentration only leads to the hypnotic state. It is well known as the Braids method of hypnosis. This wrong translation has made some people to think that samadhi is hypnotic trance. Concentration is a mistranslation of the term samadhi, which has been blindly adhered to through many generations of English translators. The term samadhi literally means balance or equilibrium. The Buddha defined it as "cittekaggata", which means the homogeneity of disposition (citta=disposition; ekaggata=homogeneity or uniformity). This term has also been mistranslated as "one-pointedness of mind," conveying the meaning of concentration. "Homogeneity of disposition" is the description of a mind free of conflicting emotions. That means harmony, tranquillity or equilibrium. It is therefore important to understand that Buddhist meditation does not involve concentration or hypnosis. Samatha meditation is not the practice of self-hypnosis, and samadhi is not a hypnotic trance. Samatha meditation is a process of purifying and tranquilizing the mind, through a series of gradually deepening levels of tranquillity. Samadhi refers to this series of gradually deepening levels of emotional and mental tranquillity, achieved through a gradual reduction of experience. The term vipassana when translated as "insight" can be misleading too. This is because the term "insight" as it is used in modern psychology, carries a different meaning. In psychology, it is used to mean a sudden solution of a problem, and in psychotherapy; it is understood as, bringing into awareness of repressed emotions. In Buddhist meditation, the term vipassana refers to an experience best described as the direct awareness of the mental process of experiencing. Experiencing here means: seeing, hearing, smelling, tasting, touching, thinking and feeling. This reflective awareness of experience is not a concept unfamiliar to the Western mind. The philosopher Leibniz referred to it as apperception. Kant distinguished between empirical and transcendental apperception. We could use the term "transcendental apperception", as Kant used it, to refer to abhinna, which is the ultimate result of the practice of vipassana meditation. One can understand this fully, however, only when one is able to experience it oneself. Until then, it will only be a theory. It is therefore not so much an experience to be conceptualized as one to be actualized. The practice of vipassana leads to panna, which occurs due to a paradigm shift, which is a shift from the "experience of existence" to the "experience of experience". It is not staying in the second paradigm but seeing experience from both points of view and gaining a broader perspective (parinna). This cognitive transparency which results from this transcendental apperception, is called "penetrative awareness" (Pali: panna ; Skrt. : prajna). Normally, we experience "existence" when we think in terms of an existing "experiencer" experiencing the existing, "object of experience". There are three parts to that experience as follows: Experiencer___Experience___Experienced (Subject) (Object) The term "existence" (bhava) refers to the apparent existence of the "subject" and the "object" of experience, on which are based all emotional relationships between the subject and the object. The normal paradigm is the experience of the existence of a subject and an object, and the relationship between them. It is to think that there is a "subject" experiencing an "object" cognitively and affectively. Through the vipassana meditation the meditator becomes aware of this experience as only an "experience", instead of as a real "existence" and a relationship. This means, the "existence" of the subject and the object is seen as an "experience" only, or as a mere product of the process of perception, or of experiencing. In other words, the subject and the object are seen as "creations of the mental process". This means, the process of experiencing precedes the notion of the existence of subject and object, not vise versa. This may be stated as, "experience precedes existence". It is seeing that "experience" is the ultimate foundation of "existence". This uncommon paradigm may be called the "experiencing of experience" which is quite different from the common paradigm of the "experience of existence". This is the paradigm shift from "existence" to "experience". When this happens, all subject/object relationships are seen as meaningless. This paradigm shift can take place only by letting go of all attachments to objects of experience, the subjectively experienced "self", and all relationships, through depersonalization. This paradigm shift is the freedom from the experience of existence, and all the suffering accompanying it. This is called the "cessation of existence" (bhava nirodha). When this happens, all sufferings, fears, worries and anxieties come to an end. This is NIBBANA, which has been defined by the Buddha as "the cessation of existence" (bhava nirodho nibbanam). This cessation of existence is not a death but the freedom from the dream of existence, which is an awakening to the reality of "impersonal experience". Therefore Nibbana (Nirvana) is the experience of the ultimate reality of impersonal experience. This idea may be confusing at the beginning, but it becomes clearer as one advances in meditation. Very often meditation is referred to as sitting. This again is a misunderstanding due to the confusion of Buddhist meditation with the Zen practice of sitting called Zazen. It is important to emphasize here that the original Buddhist meditation was not mere "sitting". Buddhist meditation is not a physical exercise but a mental training. It is not inactivity or living in a trance like state. It is maintaining a pure and tranquil mind while in any posture. It can be done in all four postures: walking, standing, sitting and lying down. Buddhist meditation is an effort to change one's thinking, feeling and behaviour, through the constant practice of introspective awareness of one's thoughts, feelings, speech and action. It is a different way of living. The main thing in Buddhist meditation is to practice the Super-normal Eight-fold Way. This way is usually translated as the Noble Eightfold Path. I find the former translation more meaningful. The Pali term "ariya" is usually translated as "noble" but it is translated here as "supernormal" because the Buddha used this term "ariya" to refer to a special level of life above the normal, which he wanted his followers to rise to, in order to be free of normal unhappiness. The normal level of experience was called the "common folk's level" (putujjana bhumi), meaning ordinary level. The term that the Buddha used to refer to this teaching was "Ariya Dhamma", which means the "Supernormal Experience" (ariya=supernormal; dhamma=experience). When the Buddha used this term "ariya", he was not using this term as a synonym for the modern term "Buddhist". He was merely referring to a level of living above the normal. One who understands and practices the teaching of the Buddha is called an "ariya savaka", meaning the "hearer" of the Supernormal Experience. In other words, what the Buddha meant by the term ariya was a higher level of growth of the human consciousness. The aim of Buddhist meditation is to raise the human consciousness to a higher level. Just as the aim of modern psychotherapy is to raise an abnormal person to a normal level of thinking and living, the aim of the Buddha was to bring the normal person to a super normal level of thinking, feeling and living. It is important to understand this distinction. This is why the translation of the term "ariya" as Supernormal is preferable. This is why Buddhist meditation is here called a "growth technique", using a modern psychological term. By practicing Buddhist meditation, one hopes to grow to a higher level of emotional maturity, where one is free of normal unhappiness. This process of growth takes place according to a natural law, and following a human technique. It doesn't happen automatically or through a supernatural power." The Dhamma Wheel, founded in 1994 under the direction of Ven. Brahmanagama Muditha Thero is a West End Buddhist Centre Publication issued four times per year. Views expressed in its pages are those of the contributors and do not necessarily represent any official sanction of the West End Buddhist Centre or the Halton-Peel Buddhist Society Tel. (905) 891-8412. Founding Editor: Kingsley Rajapaksa, Editor: Bhante T. Ariyawansa (on sabbatical), Acting Editor and Designer: Swarna Chandrasekera, Consulting Editor: Aloy Perera. Quoting: "Analysis of Experience...snip...The normal paradigm is the experience of the existence of a subject and an object, and the relationship between them. It is to think that there is a "subject" experiencing an "object" cognitively and affectively. Through the vipassana meditation the meditator becomes aware of this experience as only an "experience", instead of as a real "existence" and a relationship. This means, the "existence" of the subject and the object is seen as an "experience" only, or as a mere product of the process of perception, or of experiencing. In other words, the subject and the object are seen as "creations of the mental process". This means, the process of experiencing precedes the notion of the existence of subject and object, not vise versa." Surprisingly, this makes sense to me, on one level. I believe it is true that there is no way to ascertain the existence of an object until we "see it", "hear it", "smell it", "taste it", or "feel it". Where I am unclear, however, is once one has determined that an object is seen, heard, felt, etc., then how can one deny that it exists? Ask anyone to run into a tree, and there is no doubt that it exists, no? I suppose that if one no longer has the ability to see it, feel it, etc. then it's existence cannot be verified, but doesn't the tree still exist regardless? You need to re-read the long discussion with Aldo. Nobody is denying that anything exists here. Ven. Punnaji is also not saying this. He is not saying "This does not exist", he is saying that the idea of existance or non existance is a mental construct. First comes contact of the eye with visible object, then follows perception, sensation, and consciousness. Throw on top of this the idea "I" exist and it becomes necessary to objectify that which is not part of that idea of I. He is saying that this process is an error in that it is the source of pain. V: My profound apologies if I have offended anyone in anyway by my questions. But i would much rather stick my neck out, take the beating and ask, than to sit silent in ignorance. One more question if I may, to clarify? 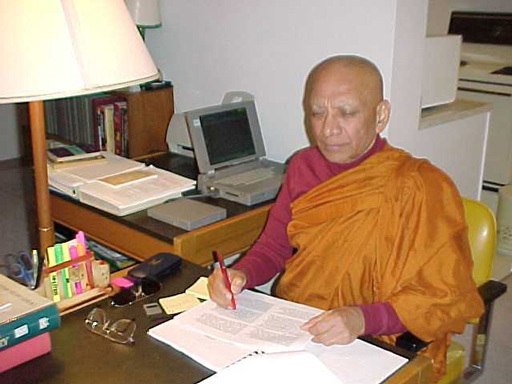 Is Bhante Punnaji talking about that when one views the world as simply "experience" that this is practicing "Right View" or "High View"? I don't see in any of what you have been asking anything for anyone to take offense at. I can't imagine that Ven Punnaji is doing the work here that he is doing for any other reason than to stimulate just such questioning. ...to your question ... I don't know. haha ... I really don't. Perhaps we may be able to find a way to persuade Ven Punnaji to address that question. OK. I have re-read both your question and Ven. Punnaji's essay, and without saying I know what was in Ven. Punnaji's mind, I would say that what is being spoken of here is not being spoken of from the point of view of High Ditthi or high view. This appears to me to be a description of the state of affairs of the Arahant, one who is past points of view. Even high view is, in the final analysis, an opinion. The interested reader should check out the discussion of Venerable Punnaji's book, Awakening Meditation.